We are growing and have been focusing on increasing our paver services into Broward county for the last year or so. Given our success in greater Miami, it’s only natural that we move northward to install brick pavers Fort Lauderdale. We have several jobs in the ground, all with very happy clients throughout Broward county. 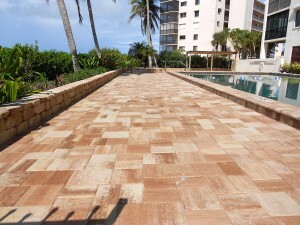 In this post we are going to highlight a large brick pavers Fort Lauderdale installation for a condo association. 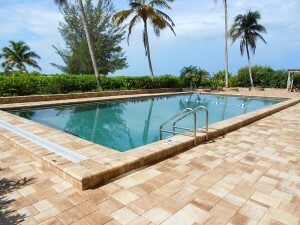 As you might guess, our expertise in pool decks and driveways is just as sought after in Broward county as it is in Miami. We are proud to be building such a solid reputation throughout south Florida as a leading brick paver installation company. We can’t do it without you! This pool deck project was for a condo association. They were tired of having to re-paint or even re-texture their pool deck every 2 to 3 years. The pool deck had cracks that kept creeping through and it generally needed to be refreshed. This is an ideal application for thin pavers over top of an existing concrete surface that won’t have to withstand vehicular traffic. The pavers here are from Tremron in their stonhurst collection. The color choice was a very common neutral brown which compliments the area nicely. We installed bullnose brick pavers around the perimeter of the raised pool step. If you look closely in the right side of the picture, you’ll even see a pergola we installed at the far end of the brick paver pool deck. Our brick pavers Fort Lauderdale services aren’t limited to just pavers, but as we mentioned above, we install pergolas as well. In addition, and as evidenced by this picture, we installed a beautiful retaining wall around the perimeter of the pool deck to give the residents a seating area and to also frame the pool against the landscaping. No more mulch, dirt, or leaves will be dropping on this deck. One other thing to note in these two pictures – the vibrant color of the pavers. This is as a result of the condo association choosing to apply brick paver sealer before they opened the deck to the residents. This commitment to maintenance is commendable and recommended. Not only will the decision help maintain the pavers over the first couple of years, but by choosing to apply sealer once the job was installed, they are protecting the color vibrancy of their pavers as pavers fade in the South Florida sun. For a little less than nine hundred dollars, we basically re-claimed our entire driveway and front porch! Ariel’s professionalism and his crew’s craftsmanship was world class.